For the 4th year in a row I’m proud to present my own personal Top 6 Games. You’ll find quite a few repeats from previous years, but also a few new faces. But enough introductions, let’s get on with the show. When I first tried Five Tribes about 4 years ago I thought it was an ok game, not a great game, just ok. This has slowly changed since then, with me liking it more and more with each play. Sure, it’s not a great game if you play with people that try to analyze everything, but it has so much to offer for those who don’t. Its basic mancala mechanism and the rules for each tribe are easy to teach, but each game feels very different thanks to the random setup. There are so many different ways to win the game, and it even works great as a 2 player game. A game I love now and that I’ll gladly play any day. 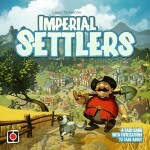 It has also had numerous expansions that I recommend getting if you enjoy the base game. I think the deck building mechanism is great, but while I like the classic deck builder Dominion well enough, I think it feels a bit themeless and soulless. Marvel Legendary, on the other hand, has too many weird moving parts. Clank! strikes a perfect balance. It’s very thematic and yet, simple. It has more than just pure deck-building going on with the movement of your thief on the board, yet it doesn’t become overly complex. For me, this is the best deck builder out there and it’s a game I always have so much fun playing. It even works great at 2, 3 and 4 players. While not a new game at all (in fact it’s from 2012) it is the first time it appears on my Top 6 list. Tzolk’in: The Mayan Calendar has always been one of my favourite games, but it just missed out on a Top 6 spot previously. Not this year. The game is simply too unique (with it’s time-turning cogs) and too great not to get a spot in this list. It’s a heavy game, yes, but one that doesn’t take too long to play while still offering you a lot of great options. The expansion adds even more with the asynchronous tribes. If you want to play a different worker placement game with a nice twist, then I highly recommend you check this one out. I love thematic euros, and it does get any more thematic than Dinosaur Island. The games merging great mechanisms, a nice flow and of course Dinosaurs. You’ll spend your turns making your dinosaur park better and better. You’ll gather dino DNA from awesome chunky amber dice. You’ll acquiring new dinos, crew and upgrades. The better and more attractive your park is, the more visitors you’ll attract and the more money and points you’ll make. One more brilliant thing about the game is that you can decide the length of the game before you start. This has everything going for it, fantastic art, a great theme and a very unique worker placement mechanism. On top of all of this it adds just the right amount of player interaction with the cards/crew. The game has a great flow that changes as you play it. It seems like a simple game on paper, but really offers a lot of depth once you’ve played it a couple of times. 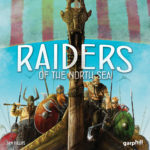 Raiders of the North Sea plays pretty quick, offers interesting choices each turn, smooth gameplay and offers a very different setup each time. Want to know what games were on the list last year? Well, then by all means click here.